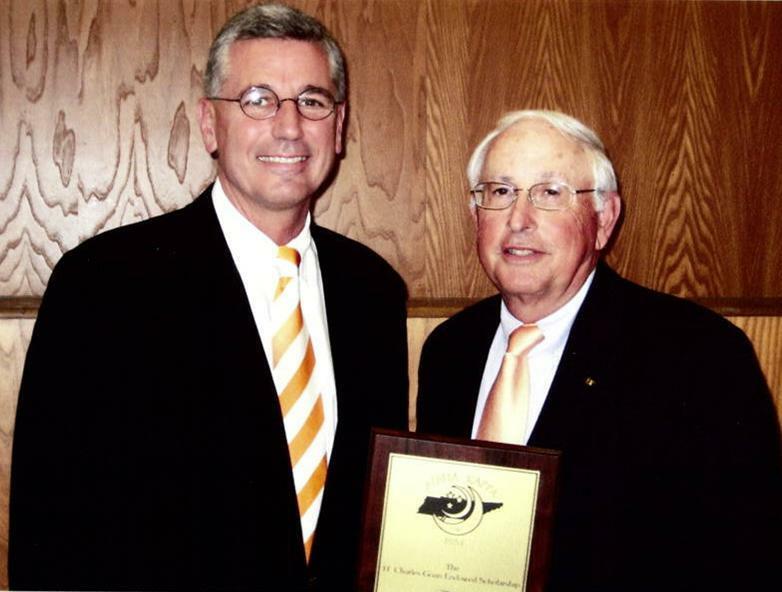 Donnie Smith, AKSN-554, of Springdale, Arkansas was named as the receiptant of the 2017 University of Tennessee College of Agriculture adn Natural Resources Alumnus of the Year at CASNR's Annual Banquet in April 2017. Brother Smith, pictured above with his college advisor, Dr. Charlie Goan, AKSN-220, the CASNR 2014 Alumnus of the Year. Donnie is the past CEO of Tyson Foods in Springdale, Arkansas. Donnie is a native of Arrington, TN and graduated from Battle Ground Academy in Franklin, TN in 1977. He enrolled in the UT College of Agriculture that Fall and pledged AGR and was initiated in January 1978. 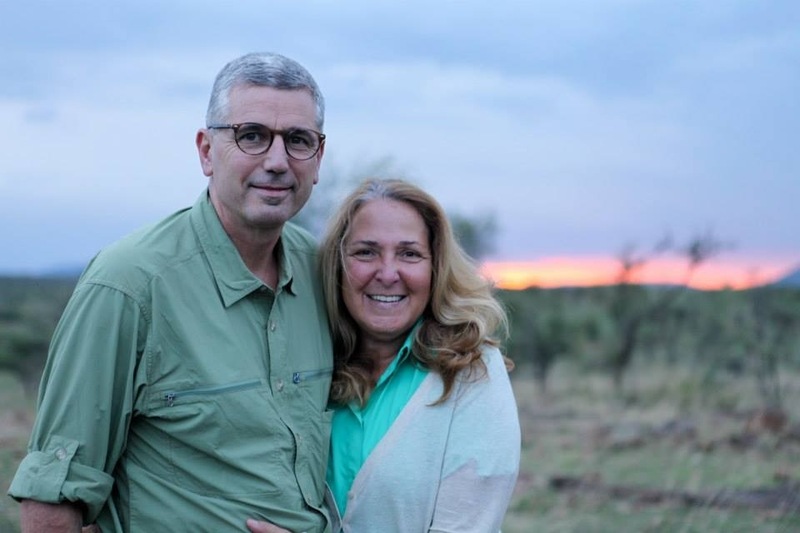 While an undergraduate, he met his future wife, Terry Wooten, an AGR Little Sister, whom he married in December 1980 shortly after he graduated from UT with a degree in Animal Science and a job waiting for him with Tyson Foods. Donnie worked for seven years as a broiler technician and feed mill manager before moving to Tyson’s corporate headquarters to because a grain buyer. From 1988 until 2009, he served in six management positions before being President and CEO of Tyson Foods, an 115,000 employee company. Donnie and wife Terry have generously support the University of Tennessee Institute of Agriculture by establishing the Donnie and Terry Smith Endowed Chair in International Agriculture. They have also made it their mission to help poultry farmers in Rwanda. The Smiths have also been generous to AGR, UT, and Terry’s sorority, Delta Gamma. They endowed the Charles Goan AGR Scholarship which is presented annually at AGR Parents-Founders Day, being the lead contributor to the Alpha Kappa building fund which is being used to renovate the 49 year old chapter house, supporting the Delta Gamma Sorority House Renovation Fund, and establishing the Student Life Excellence Endowment at UTK. Donnie has been a member of the Northwest Arkansas Council. The annual AK Alumni was held at Green Meadows Country Clun in Alcoa April 22, 2017. Alumni attending the dinner included Evan Beech Will Mayfield, David Hayes, Lewis Kinnard, Mike Estes, Larry McCraney, Bond Jones, Larry Redden, Charlie Goan, Ken Alley, Dan Wheeler, Doug Craig, Chuck Wooten, Raymond Hurd, Joe Harrison, Dwane Bell, and Brent Hurd. Undergraduates attending the dinner included Jared Bruhin, Caleb Gibson, Kyle McMullen, Andrew Swafford, JR Clay, John Calvin Bryant, Eric Carter, Weston Sharp, Jordan Pruitt, and Sam Daniel. Pictured at the Tennessee Legislative Breakfast February 22, 2017 in Nashville. 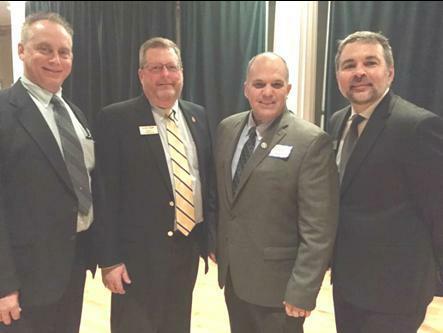 L-R: Steve York, AKSN-667, Keith Harrison, AKSN-619, Rep. Barry Doss, AKSN-621, Scott Lewis, AKSN-659. 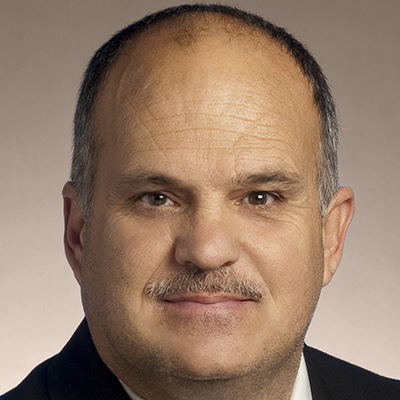 Barry Doss, AKSN-621, was returned to the Tennessee House of Representatives in the November 2016 election. Bro. Doss is a Republican representing the 70th District from Lawrenceburg, TN who was first elected in 2012. Alpha Gamma Rho and 4-H both play a pivotal role in making better men and through them a broader and better agriculture. Tennessee 4-H is the largest youth development organization in the state reaching over 170,000 4-H club members each year. While 4-H has expanded its offerings over the years to reach more youth, it has held strong to it agricultural roots offering project work in a wide variety of agricultural fields. Many AGR alumni have recognized the important work of Tennessee 4-H and give of their time and talents to support the organization at so many were a part of in their youth. The Tennessee 4-H Foundation is a nonprofit organization that exist to support Tennessee 4-H. The Foundation is governed by a 21-member board of directors comprised of influential individuals from across Tennessee. Seven of those members (pictured above, L-R) are AGRs: Mark Wilson AKSN-423, Joe Huffine AKSN-682, Reuben Buck AKSN-651, Julius Johnson AKSN-960, Larry Arrington, Florida, David Reed, UTM and Stefan Maupin, UTM, are AGR Alumni. Tammy Lee is the wife of James Lee, AKSN-481 & mother of Ben Lee, AKSN-1054, is also a member. The 4-H Foundation is run by Ryan Hensley, AKSN-999, pictured above at far right. The Alpha Kappa Alumni Association has used the 4-H program to recruit many new members through the 4-H Scholarship program. Each year the association awards a college scholarship to one or more senior 4-H members. The Scholarship both recognizes the outstanding work of the students and gives AGR excellent recognition among likely recruits. Two Alpha Kappa alumni were honored at Parent-Founders Day April 3, 2016 with their selection to Alpha Kappa AGR Hall of Fame. The two brothers selected are Don Williams, AKSN-145, (above left) and Donnie Smith, AKSN-554, (above right). These two were honored for their service to mankind, agriculture, and Alpha Gamma Rho. Don Williams of Nashville, grew up on his family’s farm where tobacco (Burley and dark fired) was the major cash crop. He graduated from Springfield High School in 1956 and came to UT that fall, pledged AGR and was initiated into AGR in 1957. While at UT, Don served AGR as Treasurer in 1958/59 and Noble Ruler in 1960/61. He also served as AGR Representative to the Interfraternity Council. On the Ag Campus, Don was a member of the Meats and Livestock Judging Teams, and credits those experiences as having been vital for his entire professional life. He was also UT Block and Bridle Club President. 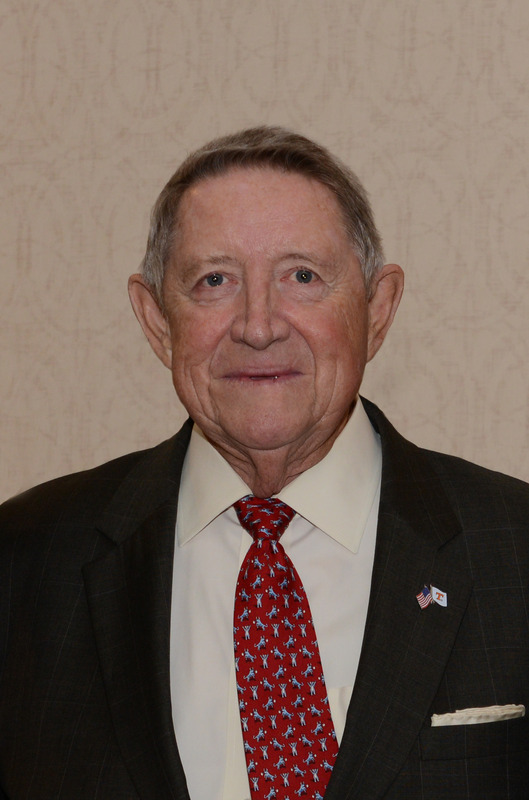 Upon graduation from UT with is degree in Animal Science in 1961, Don entered the insurance business as an agent with Metropolitan Life, becoming their leading producer and manager of their Nashville office. He next moved to Martin Hayes & Company as Head of both Tennessee and Southeast US operations. In 2000, he retired after thirty eight years in the insurance business. Don has been involved with a number of community groups. These included Community Care Fellowship, a homeless ministry, the Ronald McDonald House, Retrieving Independence, a group training service dogs, and Don served as Chairman of the Nashville Area United Methodist Foundation. 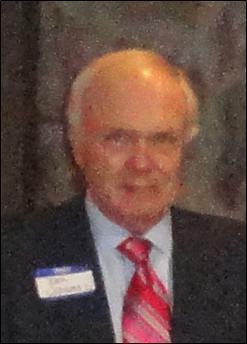 Don was the only non-contractor to serve as President of the Middle Tennessee Association of Builders and Contractors. Don is a widower with three grown children and six grandchildren. Donnie Smith is the CEO of Tyson Foods in Springdale, Arkansas. Donnie is a native of Arrington, TN and graduated from Battle Ground Academy in Franklin, TN in 1977. He enrolled in the UT College of Agriculture that Fall and pledged AGR and was initiated in January 1978. While an undergraduate, he met his future wife, Terry Wooten, an AGR Little Sister, whom he married in December 1980 shortly after he graduated from UT with a degree in Animal Science and a job waiting for him with Tyson Foods. Donnie has been a member of the Northwest Arkansas Council as well as Work Matters and the ASAP Foundation. He is a member of Cross Church of Springdale, Ark. where he is a Sunday School teacher. Donnie and Terry are parents of three children. A large group of Alpha Kappa alumni turned out for the Alumni Dinner, Alumni Association Board Meeting, and Parents-Founders Weekend held the first weekend of April 2016. Alumni attending the annual Alumni Dinner (pictured) were Joe Harrison, Doug Craig, Dan Wheeler, Brent Hurd, Lance Bracy, Larry McCraney, Gene Caldwell, Mark Wilson, Dwane Bell, Evan Beech, Bob Sinclair, Ken Alley, Bill Kemp, Max Gregory, Mike Estes, Don Williams, Jerry Estes, Jim Moore, Bond Jones, Randall Crowder, Charlie Goan, Hale Moss, Lewis Kinnard, along with a number of collegiate AGRs. Parents-Founders Weekend was March 30-31, 2015. Kicking off the weekend’s activities was an Alumni Work Day Saturday morning at the chapter house. The Annual Alumni/Active Dinner hosted by Joe Harrison at the Green Meadows Country was held Saturday night March 30 in Alcoa. Fifty alumni, actives and guests attended the gathering and enjoyed good AGR fellowship, refreshments and food. Brother Chris Maners, a Miss State alum who is in grad school at UT, joined the group. Pictured are the Brothers at the Alumni/Actives Dinner. Sunday was the annual Parents-Founders Day Banquet. A very large group of alumni, actives, parents and guests were in attendance. Alumni in attendance at one or both events included Ken Alley, Jim Nunn, Bond Jones, Bill Murphy, Gene Caldwell, Lawrence Shore, Larry McCraney, Bill Coley, Tom Looney, Mark Wilson, Joe Harrison, Eric Newberry, Randall Crowder, Mike Estes, John Schultz, Cory Vineyard, Gavin Henry, Brent Hurd, Raymond Hurt, Tracey Binkley, Dail Meadows, Dan Wheeler, and Waymon Hickman. At Parents-Founders Day April 6, 2014, four AGR alumni were inducted into the AK AGR Hall of Farm. Pictured (L-R) above are Tom Looney, AKSN-738, Mark Wilson, AKSN-423, Jim Nunn, AKSN-462, and Lewis Kinnard, AKSN-37. Lewis Kinnard was part of AGR's first Pledge Class, being initiated in 1952. 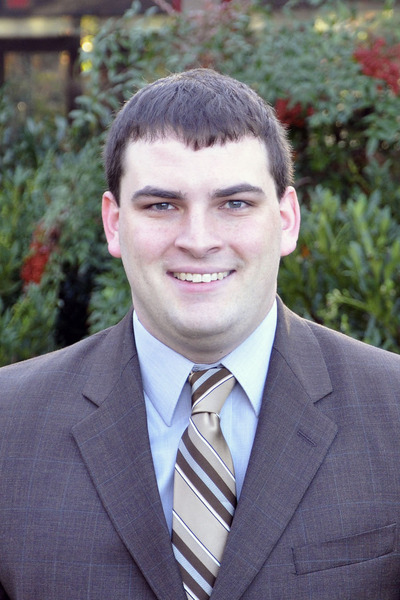 He graduated from UT Law School and has been a practicing attorney and judge in Sweetwater, Tn. and Monroe County, Tn. He is also served his country in the US Army and was a Captain in the US Army Reserve. He is a native of Spring Hill, Tn. and now lives in Knoxville. Mark Wilson is a native of Cornersville, Tn. and was initiated into AGR in 1972. He has spend his professional career with Mid-American Farm Credit Services. During these 38 years he has held many different positions including Loan Officer, Branch Manager, Senior Accounts Manager, VP of Credit, and VP of Financial Services. Mark is currently serving as Area Vice President of Farm Credit Mid-American and is responsible for operations in Tennessee. He lives in Murfreesboro, TN. Jim Nunn is a cotton broker with his own company, Nunn Cotton Co. Inc., in his hometown of Brownsville,TN. since opening his company in 1984. He was intiated into AGR in 1974. He is a 1984 graduate of the Memphis Cotton Exchange Cotton School. Jim has a son, Cap Nunn, who was initiated into AGR in 2006. Tom Looney is a 1992 AGR initiate and has a B.S. and M.S. from UTK. He is the Director of Advancement for the University of Tennessee, Institute of Agriculture and has worked for UT for more than 20 years. From 2004 to 2008 he served as Development Director for the UT Institute for Public Service before beginning his current role with UT Agriculture. Tom's father, Tom E. Looney is an AGR. Tom is a native of Crossville, TN and now lives in Knoxville. 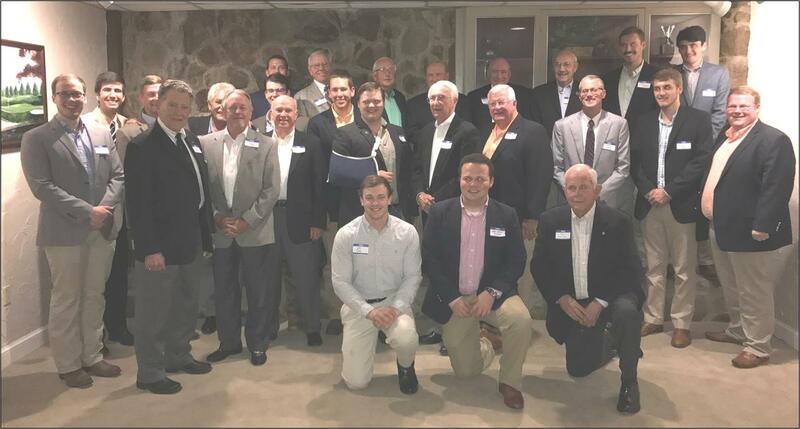 A large number of Alpha Kappa Alumni were in Knoxville the weekend of April 5-6 for the annual Alumni Dinner held at Green Meadows Country Club and Parents-Founders Day held at the Plant and Soil Science Auditorium. 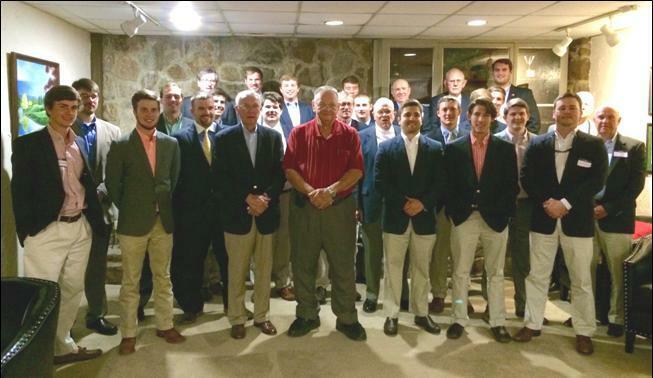 Over 40 alumni and actives enjoyed an evening of dinning and fellowship April 5. In attendance at one or both of the weekend activities included Bill Murphy, Lewis Kinnard, Mike Estes, Bill Kemp, Ken Alley, John Springer, David Bacon, Randle Richardson, Jim Nunn, Doug Craig, Larry Redden, Lawrence Shore, Larry McCraney, Joe Harrison, Glen Ed Newton, Max Gregory, Tom K. Looney, Cory Vineyard, Clay Head, Hale Moss, Charlie Goan, Steve Harrison, Kirk Huddleston, Cap Nunn, Greg Hensley, Jerry Estes Randall Crowder, Chris Hamblen, Larry Arrington, Tom E. Looney, Mark Wilson, and Gene Caldwell. Donnie Smith, AKSN-554, CEO of Arkansas-based Tyson Foods, Inc., and his wife, Terry, have personally pledged a $3.2 million gift that establishes the Donald and Terry Smith Endowed Chair for International Sustainable Agriculture through the University of Tennessee Foundation, Inc. Terry Wooten Smith was an AGR Little Sister while at UT. “The new faculty position will help bring science-based agricultural solutions to areas of the world with struggling agricultural practices and economies, as well as provide unique opportunities for the State of Tennessee,” said Larry Arrington, chancellor of the University of Tennessee Institute of Agriculture, when announcing the gift. Waymon Hickman, AKSN-116, has been honored as the UT Institute of Agriculture’s first UTIA Meritorious Service Award, presented at last fall’s Ag Day celebration. In addition to this honor, Bro. Hickman, in 2013, was honored with the National Agricultural Alumni and Development Association’s 2013 Outstanding Philanthropist Award and the Council for the Advancement and Support of Education’s District III 2013-14 Volunteer of the Year Award. His endowment has funded 650 scholarships for students at the Institute of Agriculture. Waymon is a former UT trustee and is an Agricultural Education graduate of the UT College of Agricultural Sciences and Natural Resources. Dan Wheeler, AKSN-227, was selected as the UT College of Agricultural Sciences and Natural Resources 2013 Alumnus of the Year at the College’s annual banquet held in April. Dan grew up on a cattle farm in Crab Orchard, Tennessee. Upon graduation from UT in December of 1964 with a degree in Animal Science, Dan went to work as an Agent for the Tennessee Farm Bureau Federation (TFBF). After two years as an agent, Dan became a Regional Field Director ((1967-1970) before being named Director of Field Services for the TBFB (1970-73). 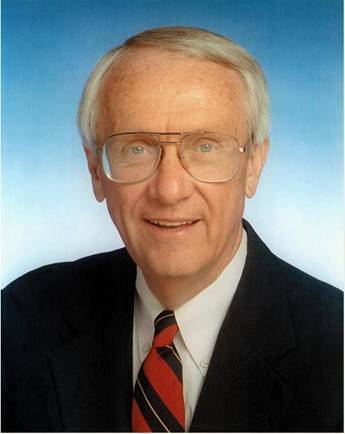 From 1973-1985 he served as Assistant to the TFBF President and Chief Legislative Lobbyist before being named TFBF Chief Administrative Officer, position he held from 1985-1994. In 1994, he was appointed Commissioner of Agriculture for Tennessee, a position he held until 2002. In 2003, he was named Director of the UT Center for Profitable Agriculture, a position he held until 2007. He currently serves on UT Institute of Agriculture Development Board. In 2000, Dan was selected as Progressive Farmer Magazine’s Man of the Year in Service to Tennessee Agriculture,. He also has been the recipient of the Alumni Award of Merit from Gamma Sigma Delta, received the State Friend of Extension Award, was named Distinguished Alumni of Block and Bridle, and received an Honorary State Farmer Degree from Tennessee FFA. Brother Wheeler was initiated into AGR in 1962. As an alumnus he served as Alumni President and was recognized by the National Alpha Gamma Rho Fraternity as a “Brother of the Century” in 2004. He was selected to the Alpha Kappa Chapter AGR Hall of Farm in 2001. Dan and his wife Carol are the parents of two sons and five grandchildren. Parents-Founders Day 2013 kicked off with the Annual Alumni Dinner hosted by Joe Harrison at Green Meadows Country Club in Alcoa. A nice group of alumni and actives were in attendance. There was a nice contingent of collegiate AGRs at the dinner as well. Pictured (L-R); Josh Goode, Joseph Rackley, Cory Vineyard, Evan Smith, Elliott Reynolds, Reed Wolfe, Forrest Duncan, and Robbie Gipson. “You are going to get to choose two things when you leave here. You are going to get to choose your standards for living and you are going to get to choose your standard of living…But I have seen a lot of people along life’s way who prioritize their standard of living above their standards for living…In every case, I have every seen, they blow themselves up. So I am going to encourage you to put your standards for living above your standard of living.” – Donnie Smith AKSN-554, president and CEO of Tyson Foods and a 1980 animal science graduate, speaking at the College of Agricultural Sciences and Natural Resources commencement ceremony. Ryan Hensley, AKSN-999, has been named Executive Director of the Tennessee 4-H Foundation. Ryan was initiated into AGR in the Fall of 2005. In 2011, he completed a Master of Business Administration and a Master of Science in Agricultural Economics from the University of Tennessee, Knoxville. He earned a Bachelor of Science from UT in 2009. Ryan is the son of former Rhomate Debbie Willis Hensley and Greg Hensley, AKSN-536. Hensley will lead fund raising efforts so that other youth can have the same experience that he enjoyed. He will work with private donors, 4-H alumni and corporations in development work. As a 4-H member, Ryan served as Tennessee 4-H Congress Governor and as State 4-H Council President. ALPHA GAMMA RHO CELEBRATES 60 YEARS AT UT APRIL 9-10, 2011! The weekend of April 9-10, 2011, Alpha Kappa Chapter at UT celebrated its Diamond Anniversary with a number of events. The morning of April 9, 11 alums from the 50s gathered at the chapter house to tell stories from the early years. The Tennessee Farm Bureau Federation kindly sponsored the video taping of these alums from the 1950s to record for ever their AGR stories. Brothers participating in this even coordinated by Joe Gaines AKSN-311 were Donald March AKSN-3, Bill Murphy AKSN-8, Gene Caldwell AKSN-9, Lindy Gill AKSN-10, Bill Kemp AKSN-34, Lewis Kinnard AKSN-37, Brent Hurd AKSN-78, Lance Bracy AKSN-110, Joe Harrison AKSN-111 Charlie Darnell AKSN-131, and Johnny Bruff AKSN-183. Later that afternoon, a golf tournament consisting of alumni and actives played the course at the Green Meadows Country Club. Winners of the scramble were the team of Charlie Goan and . John Schultz won the closest the pin competition. That evening, a reception at Green Meadows Country Club began with a reception followed by dinner and the evening’s program. Over 100 alumni, activities, wives and girl friends were in attendance. Alpha Kappa Alumni Association Vice President Bro. Greg Hensley AKSN-536 presided in the absence of new father and Alumni Association President Jon Frady. Rev. Mike Hensley AKSN-406 offered the blessing. AGR Grand President Sandy Belden was the keynote speaker. Dr. Gene Caldwell spoke briefly on the founding of Alpha Kappa Chapter and its history. Tennessee State representative Vance Dennis AKSN-824 presented the chapter with a proclamation from the Tennessee State Legislature citing and commemorating AGR’s 60 years at UT. Bro. Hale Moss AKSN-298 recognized Mrs. Dee Lidvall, Prof’s widow, their two sons and their wives and two granddaughters. Brother Moss gave an Eulogy in remembrance of Prof. Bro. Mark Wilson AKSN-423 gave the group an update on the Campaign for AGR and announced to the group that the scholarship program had been renamed as the Prof Ed R. Lidvall AGR Memorial Scholarship Endowment. Bro. Jim Nunn AKSN-462 recognized the 92 deceased brothers. At the end of the program pictures were taken of the brothers attending the banquet as well as pictures of the brothers from each decade. Bros. Joe Gaines AKSN-311 and Ken Alley AKSN-296 were Co-Chairmen of the 60th Anniversary Celebration. Sunday April 10 marked the annual Parents-Founders Day luncheon held in Hollingsworth Auditorium. A huge crowd of AGRs (actives and alumni), parents, wives, girlfriends and supporters were in attendance. Special guests include Dr. Cayla Beyl, Dean of the UT College of Agricultural Sciences and Natural Resources, Susan Marks and John Long, mother and uncle of the late John Long Marks, Mr. & Mrs. Jim Bletner, son and daughter-in-law of the late Dr. J. K. Bletner, and Mrs. Dee Lidvall and family. Alumni attending one or more of the weekend events were: Larry Redden, Tracy A. Binkley, Bill Murphy, Linden L. Gill, Mark Wilson, Bill Kemp, Mike Estes, Dwane Bell, Bill Craig, Doug Craig, Joe Harrison, Joe Gaines, Jim Nunn, Ken Alley, Don March, Thomas White, Louis Buck, Glen Newton, Brent Hurd, Jim Moore, Max Gregory, Johnny Bruff, Dan Wheeler, Mike Hensley, Keith Harrison, Dail Meadows, Charles Goan, Clay Head, Tom Looney, Charlie Elder, Lewis Kinnard, Chuck Yoest, Lawrence Shore, Lance Bracy, Brick Veirs, Daniel Hale, Will Nichols, David Lee, Raymond Hurd, John Tarpley, Bill Coley, Gene Caldwell, Vance Dennis, George Childress, Ben Sanders, David Hayes, Phil Baggett, David Owen, Bill Newman, Stuart Morris, Charles Harrison, Steve Harrison, Paul Harrison, Kirby Reed, Robert Elliott, Ryan Hensley, Don Smith, Jody Wallace, William Elliott, Jerry Estes, and Aaron Fisher. Over 125 brothers, both alumni and active, participated in the weekend’s 60th Anniversary and Parents-Founders Day activities.